2014 will see an acceleration and expansion of transformation programs. All the dynamics are in place to create a compelling reason for companies to transform. This 14 part series takes a closer look at transformation and the likely path it takes in the next decade. This is the first piece in the series. Links to the other parts of the series are included at the end of this post. These pieces continue to describe the transformative period that lies ahead. As we look at this and other thought provoking pieces, our job as leaders is to assess the potential impact to our organizations. Readers of my Blog know that I have focused my own assessment on the enterprise of 2020, or what I have been calling the Digital Enterprise. So I have worked to develop a high level road map based on my own perspective and experiences, ongoing executive dialog, and key pieces of market thought leadership. I will use the next several Blog posts to summarize my thinking. The road map is focused in two key areas: The forcing functions that drive the need to transform and the enablers that require investment to get us there. Forcing functions are those things that force the enterprise to invest in a future state. The forcing functions and a vision to address them are critical, as far too many leaders continue to sit on the sidelines with no impetus to invest in this future enterprise. 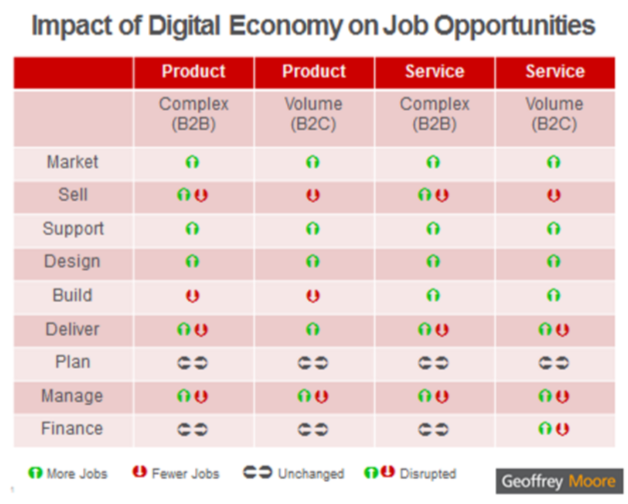 Geoffrey Moore recently authored a Report focusing on middle class job creation in the Digital Era. These same forces that Mr. Moore describes in the context of job creation are disrupting the very fabric of the traditional company. This is a fascinating look at the state of middle class jobs in developed countries. This diagram from the report effectively summarizes his views on the topic. The grid focuses on the nine basic areas of employment inside an enterprise, across a product and a service business model. The columns are further divided into complex (B2B) and volume (B2C) businesses. My belief that digital is still very misunderstood is growing stronger. Instead of understanding digital to be the transformative engine that drives sustainability – it is still viewed as an offering or channel. Those are indeed critical pieces of the digital story, but it’s not the whole story. Those very innovations that drive our current disruptive environment – transform us to deal with the aftermath. Our customers have shifted – and we can’t shift with them if we are inhibited by traditional views of digital. I participated in a recent think tank discussion, where people talked of digital’s small contribution to revenue, concluding that it was not worth the focus. In part one of this six part series; I focused on Holistic Strategy – the first step on the digital enterprise journey. In part two, the focus shifts to experience-based differentiation. With the rapid commoditization of products and services, the speed at which new market entrants emerge, and the rise of Consumerization, experience is the new battle ground. When I talk of experience, I mean stakeholder experience. Ultimately, it’s about creating differentiated customer experiences – but to get there, the experience we create for our employees and partners is critical to that end goal. In the latter months of 2012, LinkedIn launched a Blogging platform for some of the world’s best known thought leaders. As part of that series, 50 posts were gathered to provide a perspective on the biggest ideas for 2013. I have categorized each of the posts and have provided a link below. There are great perspectives provided in some far reaching categories – including my favorite topic: Digital Enterprise.